One of the many arrangements I have in my house- my vases are filled with flowers picked before the storm. 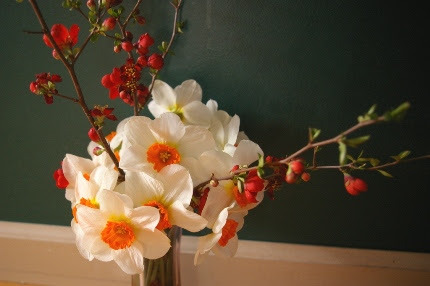 That is ‘Crimson and Gold’ quince with narcissus. the rest of your seeds, bring home some pansies and Ranunculus and put them IN your house to cheer you up. 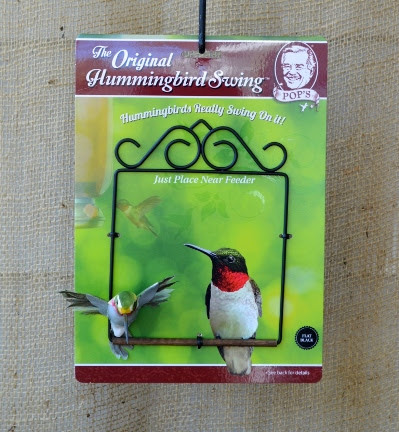 Check out our new hummingbird swings. What? Yes, you heard me right. Hummingbird swings. You didn’t know you wanted one until you realized they existed and then, of course you do! Click on this linkand watch the COOLEST video of hummingbirds using this swing. I guarantee that will take your mind off of the cold weather for a while. Stock up on your organic fertilizers for the lawn and garden so that when the snow melts you will be ready to go. Make a terrarium or a fairy garden as a stopgap planting project. This Saturday, NO MATTER WHAT, I am giving the first Saturday morning garden walk of the season. It is all about waking up the garden. The rain expected on Thursday will have melted all the snow and we will be able to see the gardens again. I will teach you how to prune summer and fall blooming shrubs (Callicarpa, Abelia, butterfly bushes, tree hydrangeas…) and how to feed the garden using our Magic Formula. Feeding is VERY important as many of our plants will be stressed from the freezing temperatures and some may have to grow new leaves if they have been frozen. Following the walk (and birthday cake for yours truly), Jillian will lead a workshop on planting Lettuce Bowls. These will feed you for a long time, and can be carried inside if Mother Nature decides to continue to play games with our heads again. Ha! Register for this 1 pm workshop and learn all about planting and growing lettuce. You will plant a big bowl to take home. See the events section below for the details. We are still getting our first shipment of early spring organic veggie seedlings in later this week, specifically for the lettuce bowls but also because you will surely want to grab them this weekend and have them at the ready as soon as this crazy cold weather breaks. “Faith is the bird that sings though the dawn is still dark”. That is a saying I have framed on my guest room wall. 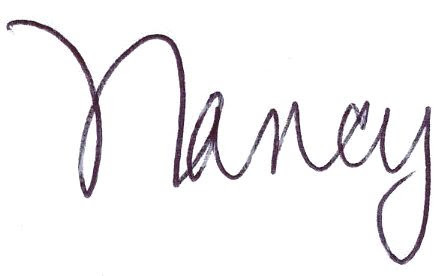 You can imagine how many times it has given me strength and comfort. On Monday, as the snow flew and the ice fell, ALL DAY LONG in fact, a cardinal was singing in the spruce tree outside my office window. Although realistically I know it was probably some kind of mating call, I read it as a sign that, despite the snow and cold, the birds are singing their hearts out. We can too. Keep the faith my friends, and stop in for a visit to cheer up and get RE-inspired!